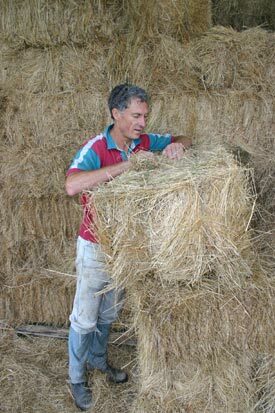 A horse study looking at the effectiveness of using outdoor feeders for small hay bales found that all designs tested paid for themselves in fodder savings within a year. The University of Minnesota research found major reductions in hay waste. The findings have just been published online in the Journal of Equine Veterinary Science. Associate Professor Krishona Martinson and her colleagues found that hay waste ranged from 13 percent when no feeder was used to just 1 percent with the use of a slat feeder. All feeders had paid for themselves in 12 months, they said, based on a hay price of $US250 a ton. No injuries were observed when horses were fed from the bale feeders. The researchers said hay waste during feeding represented a costly expense for horse owners. The aims of their study were to determine hay waste, herd body-weight change, hay intake, and the economics of small square-bale feeders used in the outdoor feeding of horses. Feeder designs included a hay rack, slat feeder and basket feeder, with the control being the use of no hay feeder at all. Feeders were placed in separate outdoor dirt paddocks. Twelve horses were divided into four groups and rotated through the paddocks. Horses were weighed before and after each rotation. Horses were fed grass hay at 2.5 percent of the total herd body weight, split evenly at 8am and 4pm. Waste hay and scraps were collected before each feeding. The amount of hay wasted when no feeder was used was assessed at 13 percent. The waste with a hay rack was assessed at 5 percent, while the use of a basket feeder resulted in 3 percent waste. The least waste was achieved with the slat feeder, at 1 percent. The hay rack paid for itself in 12 months, the basket feeder did so in 11 months, and the slat feeder had recovered its cost in just 9 months. Herds gained 10kg when feeding from the basket feeder and 7kg when feeding from the hayrack. They lost 3kg when feeding from the slat feeder and lost 11kg when no hay feeder was used. Estimated hay intake was 2.4 percent of body weight for the basket feeder and hayrack, and 2.2 percent for the slat feeder and no-feeder control. A.M. Grev, E.C. Glunk, M.R. Hathaway, W.F. Lazarus, K.L. Martinson. Any chance of pictures of the different types of feeders? Yes, would like photos. Also, if slat feeders wasted the most, why did the horses lise weight and have thd lowest hay intake (of the feeders). Doesn’t add up. I use basket feeders for mostly round bales. It does have less waste/mess in the field, but not sure if it pays for itself in a year. At $450/feeder and $50/ bale (= to 15 squares) it would have to save 9 bales/ season. We use 3 feeders in the field with 20 school horses and ponies, plus roll out a 4th bale. Lasts 4-5 days in Canadian winter.